2002. Fresh from select U.S. performances in 2002, this purely live double-CD documents the current evolution of Steve's iconoclastic live experience after 24 years of electronic concerts worldwide. During the first half of this year, Steve was on the road constantly, playing in one city, then setting up the live system in The Timeroom to reflect on that week's performance, developing new sounds in response. The music evolved through this process, offering a refreshing alternative to the "tour-'til-you-drop" approach for the composer and audience alike. Elements from CORE, STREAMS & CURRENTS, EARLY MAN and INNERZONE are present, but the spontaneous moments within these two CD's, along with many new pieces and spaces created just for these events, create an atmosphere than can only come from stepping outside the safety of the studio. From the intimate to the immediate, ALL IS NOW captures Roach's deepest, most intense and searching sound journeys undertaken with an entire audience onboard. These "mobile Timeroom" events were recorded at Sedona Arizona, Oakland and San Francisco California, Portland Oregon, and the SFMOMA / Yoko Ono event in June 2002. "All is Now, Steve Roach's newest double-CD release on Timeroom Editions, represents Roach's 24 years of nearly nonstop dedication to presenting live electronic music worldwide. This is a collection of selected live recordings from his 2002 tour of the U.S. including Sedona, Arizona, San Francisco, Oakland, and Portland, Oregon. CD One is a blend of four live concerts including a portion from the premiere party for Yoko Ono's "Yes" exhibit at the San Francisco Museum of Modern Art. CD Two is a complete set from a recent Sedona, Arizona concert, just as it occurred, with a full-house audience. 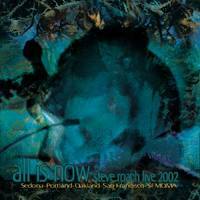 All is Now is a dialogue of in-the-moment sonic excursions woven from elements of recent studio albums CORE, STREAMS & CURRENTS, EARLY MAN and INNERZONE, as well as a varied collection of new sounds and pieces created for these live concerts. The recordings are taken from both theater-size venues and non-traditional performance spaces, dramatically capturing the current state of Roach's living sonic vision. That vision taps into the roots of his mandala-like trance pieces, signature atmospherics and neo-tribal groovescapes, weaving it all into one continuous sonorous stream. The All is Now excursions are an organic maelstrom of elemental earth sounds didgeridoos, shamanic percussion, clay flutes and analog and digital synthesizers sculpted by various synthetic treatments and evolving, real-time effects processing. These recordings also feature Steve's live debut on electric-guitar-triggered atmospherics on "The Infinite Heart", recorded in San Francisco. Roach's artistry as a sound sculptor is an inspiration, given the current status quo, paint-by-numbers mentality which relies on samples and generic synth presets. As a sonic iconoclast, Roach's live music sets are challenging certainly not for the faint of ear. Taking Roach's music into your reality tunnel is to traverse the core of an experimental electric storm. Through exotic textures, subterranean rhythms and expansive vistas All is Now reaches critical mass at many points throughout the two disks. For Roach, this releases is a significant step forward in the live experience as a living art form a bridging of the studio and stage. Not a premeditated occurrence, the now energy of these concerts is what brings audience members from great distances. Roach prepares each concert by creating his palette through extensive hours of studio time leading up to the events, preparing possibilities, working on pieces and sounds. Yet when the time comes, the all-is-now attitude is what shapes the journey. Roach is able to connect to his audience through the sound, uninhibited by preconceptions. Roach clearly trusts his "in-the-moment" creative juju. He graciously accepts the here-and-now, soul-rattling concert experience as a natural occurrence. With All is Now, Roach invites us to join him on an exhilarating expedition to the edge and beyond. Would we expect anything less?"